Chinese Kung-Fu (referred to as "Kenpo" in Japanese) practitioner. Trained in China and became the heir to his Kung Fu style in his temple. Despite his great knowledge in his style he does not open his mind to the possibility of learning from other disciplines at first but after striking up a friendship with Katsumi Orochi post tournament he appears to want to teach as well as learn at the Shinshinkai Dojo. He fights Sergei Taktarov in round 1, Mount Toba in round 2, and destroys Orochi Katsumi in round 3. He then makes it to the semi-finals of the Maximum Tournament and is pitted against Baki Hanma where Baki nearly kills him by breaking his neck. In the "Search of Our Strongest Hero" saga, he has encounters with the British convict Hector Doyle and American convict Dorian. Retsu brings Baki to China to cure his poisoned body and have him fight in a Chinese Tournament. 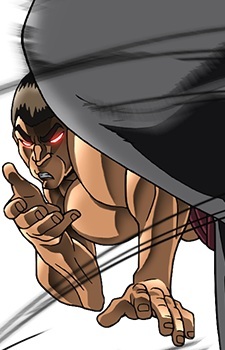 He reappears in Baki: Son of Ogre, during the Pickle saga, having a fight with the prehistoric man and losing it. He then gets his leg eaten by Pickle, as a "gift" for his victory. He later trains Katsumi so that he can become stronger before his fight with Pickle. Sometime afterward, it appears Retsu wants to take his plans to truly educate others about the Chinese martial arts global, and so he enters a boxing gym seeking strong opponents, the coach asks him to do a strength test by punching a bag with all his strength, Retsu does so apprehensively and destroys the bag, a few days later at the gym a flash boxing promoter/manager enters the gym and sees Retsu practicing not boxing but a Kung Fu exercise just standing their maintaining his pose for nearly 2 hours, and an idea flashes in the manager's head and he arranges an exhibition match between a former champ and Retsu, during the course of his next few fights it appears Retsu has gained some respect for Western fighters as well as showing them how to absorb damage, hit with absolutely all their strength and use lightning speed, (as well as making millions in the process for these exhibition matches but seemingly completely indifferent towards the money).